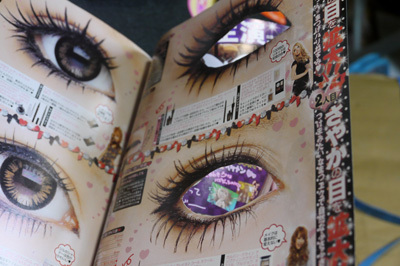 Wanna Have Big Eyes like a Japanese Gal (Gyaru)? 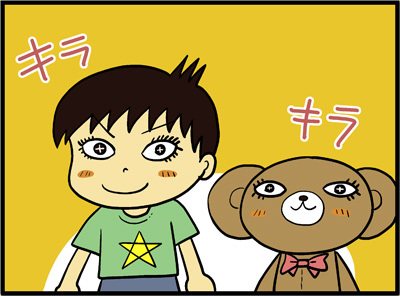 Among Japanese gals, it is agreed that the bigger eyes you have, the more lovely you are. 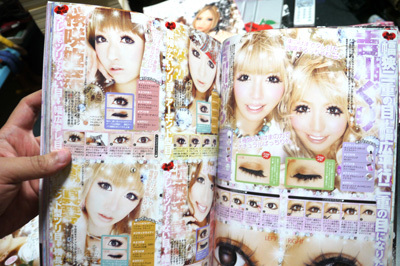 In every issue, gals’ magazines show how to make your eyes appear HUGE . 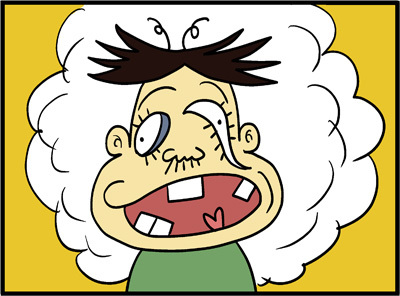 The other day, I found a blogger’s wonderful attempt at eye-enlargement. 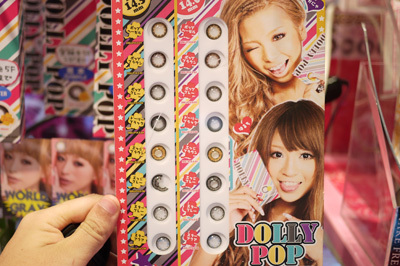 Are you interested in the world of gals’ big eyes? Well, this blogger is. He doesn’t have any interest in disguising himself as a woman, though (^^;). 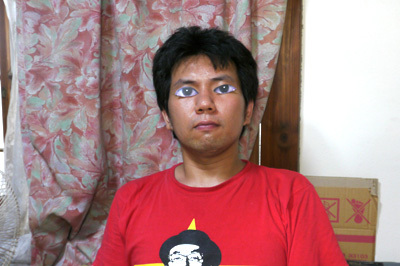 This is the guy who tries to wear gals’ make-up. 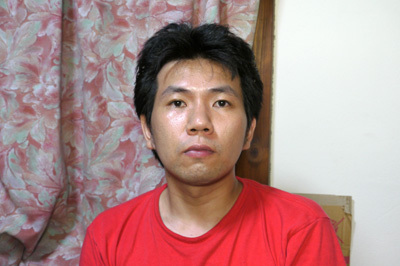 He looks perfectly normal Japanese man. This is a magazine called “Koakuma Ageha”. “Koakuma” means a sweet devil, and “ageha” is the name of a beautiful kind of butterfly. The girls on the magazine look so gorgeous! I hope that his attempt will succeed. The writing in the magazine is too shiny and sparkling to read. The gals’ world must be very unfamiliar to him (also to me and you guys! ), but people are sometimes attracted to unknown fields. Let’s peek into the gals’ world with him. I wonder how they make their eyes so big? 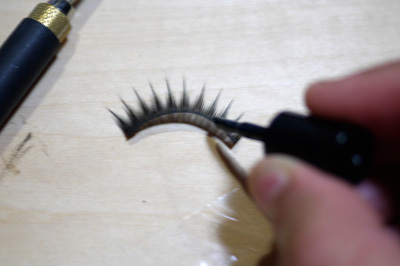 Gals use false eyelashes to make their eyes bigger and bigger. Don’t you think it’s too much?? They also use eyeliner to draw bold lines far around their own eyes. This creates the illusion of size. This is how to make cute drooping eyes. A strong slanting line is drawn. Gals don’t seem interested in their own eyes’ shape or size at all. It seems very strange, but it might be OK when viewed from a distance. The book he bought at a used-book store has a page like this. Someone cut the eyes out! Now, it’s our blogger’s turn. Let’s go shopping! Wow! 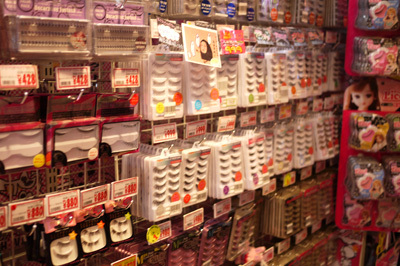 There are many kinds of false eyelashes. It’s hard to chose one. 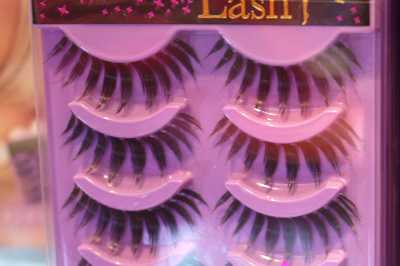 Are these also eyelashes?? Maybe good for parties! 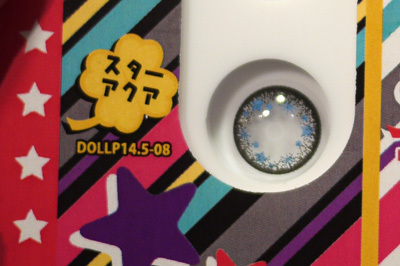 Colored contacts are also very popular among gals. He chose this kind; “Star Aqua”. 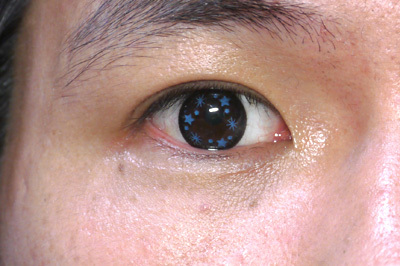 Can you see the stars in his eye? Just like a Japanese manga heroine! 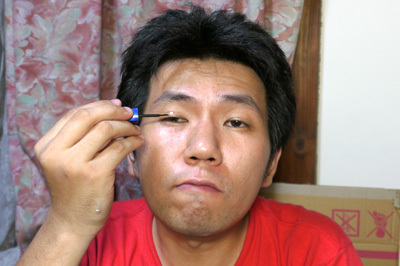 Again, this is average blogger who is trying to wear gal’s make-up. 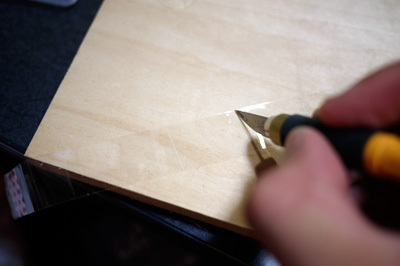 And this is Scotch tape. 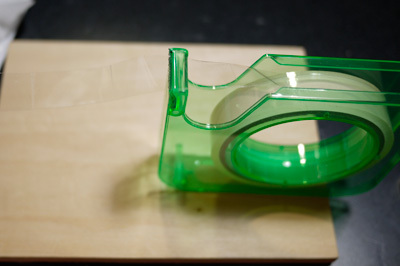 But why Scotch tape??? He cuts out a small piece, but why?? 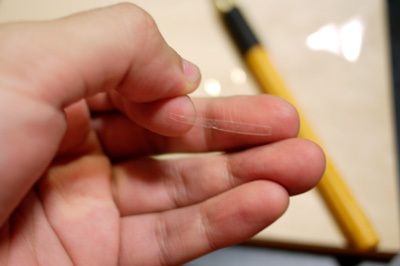 Let’s see how he uses this tiny slip of Scotch tape for his make-up. Amazing! He made his eyelid double with Scotch tape. 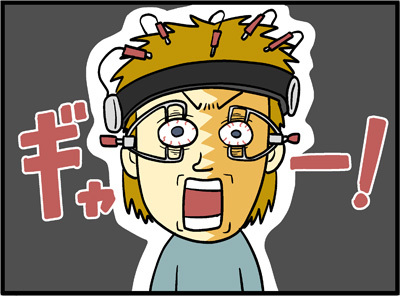 Most Japanese people have eyelids with no fold. 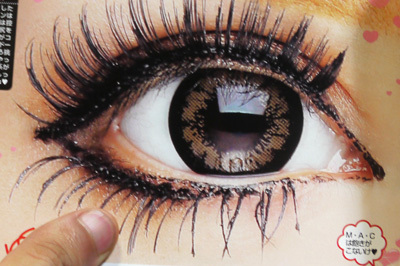 Gals don’t think this is cool, so they use tape to make artificial folds on their eyelids. 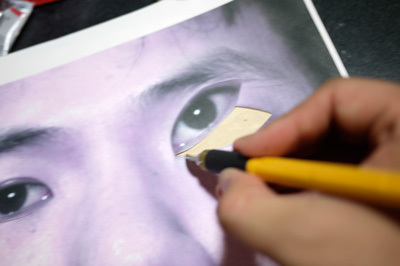 (They usually use a special kind of tape for eyelids, not Scotch tape.) Now, let’s keep going. Maybe OK. Well, really OK? 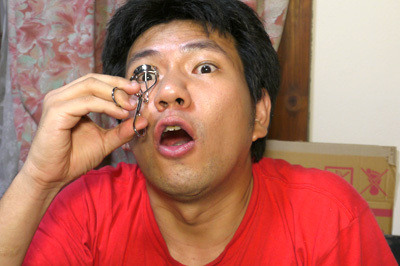 He’s using a eyelash curler. This photo is a little like……. 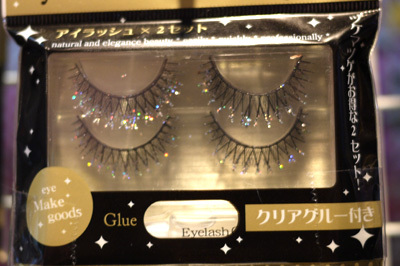 False eyelashes are affixed with some glue. Oh my god! Look at his eyes!! ………this! What a stupid look! Was his make-up wrong, or is it just his face?? He still doesn’t give up. photograph himself and enlarge the print! Ta-da! 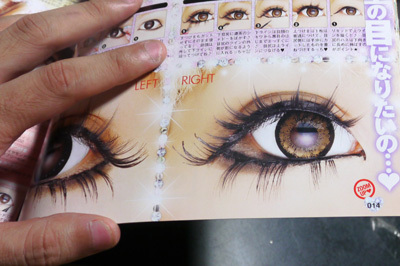 Sure, now he has big eyes, but they are not authentic gals’ eyes. I think he forgot his original purpose. We saw many, many steps for applying gal’s make-up. It must take a lot of time for gals to get ready every morning. I can go out right after getting up, but maybe they can’t do it. To be a cute gal is very difficult (T_T).